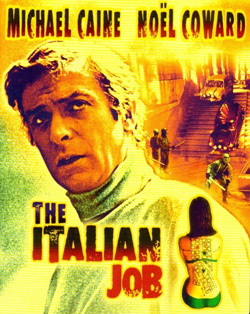 The Italian Job is a ‘British’ film starring Michael Caine that was made in 1969. It is about a carefully planned heist involving gold bullion being stolen by an ‘English Mob’ from underneath the nose of the Mafia. The film achieved critical and commercial success and traded on the recent success of the England football team winning the football World Cup in 1966. It remains an iconic British film containing significant British cultural stereotyping with key scenes often still studied and discussed to this day with lines repeated to the point the film has now become part of popular culture. The film had high production values and a wide cinema release due to its distribution by Paramount Pictures who had already established a key interest in British films like Alfie (1966) also starring Michael Caine. ‘Britishness’ was still a successful commodity by the time the film was made on the back of the ‘Swinging 60s’ reflected in part by the memorable Mini Cooper escape sequences. The Hollywood studio Paramount remade The Italian Job (2003) with an all American cast including Donald Sutherland, Mark Wahlberg and Edward Norton.